File this under the “I’m so above average it’s not funny!” file, but an article out of The Unofficial Apple Weblog recently has some interesting stats about your iPhone usage. Based on a survey of 1,000 iPhone users, the average Apple smartphone user has 108 apps and spends close to an hour and a half per day poking away at their favourite device. This does include the 20 or so pre-installed apps that come with the iPhone but the article doesn’t go into more detail as to which app(s) are the top used. Yeah I know – probably Angry Birds! 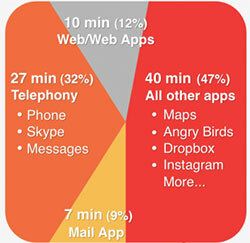 The result does indicate only about 12% of the apps are web/web based apps – but then they go on highlight that 9% is “mail use” and of the ‘other apps’ accounting for 48% of usage includes apps such as Instapaper and Dropbox (there’s another chunk dedicated to phone use too if you’re wondering if I couldn’t add). I won’t get into the age old “What’s the different between the Internet and the Web” debate here but I think it shows that formal “web based” apps or not, the iPhone is certainly a connected device. Top iPhone Apps This Week Recommended by YOU!